So much in Los Angeles changes fast. Treasure the good things that don’t. … On a recent Saturday morning, after flipping on the lights and tying a black apron over her crisp white shirt, the 78-year-old, who has 4 grandchildren and six great-grandchildren, set to work arranging the jams, knickknacks and nut butters in precise stacks and V-patterns on almost every inch of countertop. “Top of the morning!” said a kind-looking man in a khaki windbreaker just as she was finishing up. “And the rest of the day to you!” she chimed back to Peter O’Malley. A year ago, I published a couple of pieces for Variety on what I called “The Wallflower Syndrome,” named in honor of 2012’s “The Perks of Being a Wallflower” and describing films that weren’t getting the awards consideration they deserved, in large part because they didn’t have the right pedigree, or they simply weren’t loud enough to grab people’s attention. This year, I’m making “Short Term 12” winner of my just-formed 2013 Wallflower Syndrome Award. It’s a wonderful movie, with an absolutely superb performance from Brie Larson, that really should be seen and considered with the best film work of the year. This is a fun interview with National League Cy Young Award-winner Clayton Kershaw, especially with the twist at the end. Best wishes also to Nick Punto, who has signed a nice deal with Oakland. If you haven’t come up with a better way to achieve your goals than hazing, you are not trying hard enough. Period. J.P Hoonstra of the Daily News captures how these Ned Colletti Dodgers are not your slightly older sibling’s Ned Colletti Dodgers. Too much interesting stuff to excerpt here, so go read the whole thing. … I’ll post again after the Dodgers make their first-round selection in today’s draft. The big question: Will they again buck the growing wisdom, racing from radical to conventional, that it is safer to take college players than high school players? James Loney appeared to make the Dodgers look smart last year in going the old (high) school route with his stellar Rookie League season in 2002 at age 18. This year, however, Loney is batting only .252 with an OPS of .688 in the A-ball Florida State League, so although he may of course make it, it’s not going to be a cruise to the majors after all. It’s not that college players are locks to succeed. Bubba Crosby, for example, was a college man. Scouts rated him a dubious first-round pick in 1998, and only recently has he begun to even challenge that assessment. And as a Stanford graduate, it pains me to note that ever since Mike Mussina and Jack McDowell, baseball has been littered with the carcasses of lumpy Cardinal pitchers – the latest being Jeff Austin, who tied a major league record in May by allowing home runs to the first three batters of a game. Nevertheless, there is solid research out there for anyone to see that your odds are better if you allow colleges to help you weed out the suspect prospects. If you don’t, you’re much more likely to end up with an abysmal draft history like that of the Dodgers. There isn’t much advantage in getting a younger guy – the point is to try to get the right guy. Holly Webb of TheChattanoogan.com reports on the dismissal of reckless driving and speeding charges against Dodger outfielder Yasiel Puig (link via Tony Jackson of Dodgerscribe). … Judge David Bales presided over the case. After reading the charges, he read a letter written by the Dodgers’ Executive Vice President and Chief Marketing Officer Lon Rosen on Puig’s behalf. 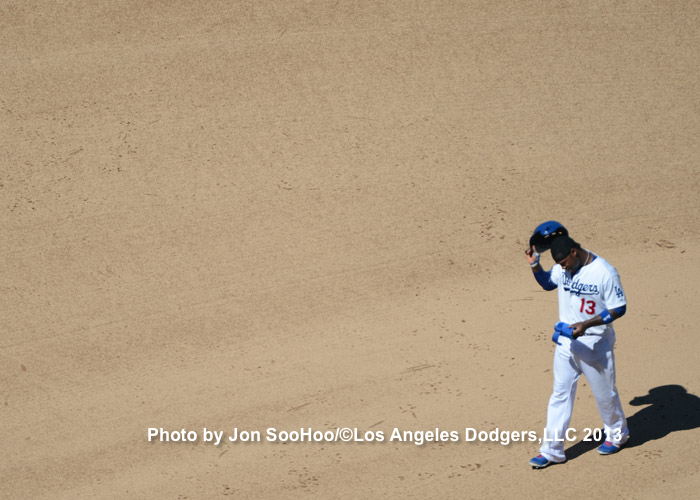 The letter detailed Puig’s involvement in the Los Angeles community and called him “an asset.” Rosen said that Puig was active in several charity organizations that worked with underprivileged youth in the area. 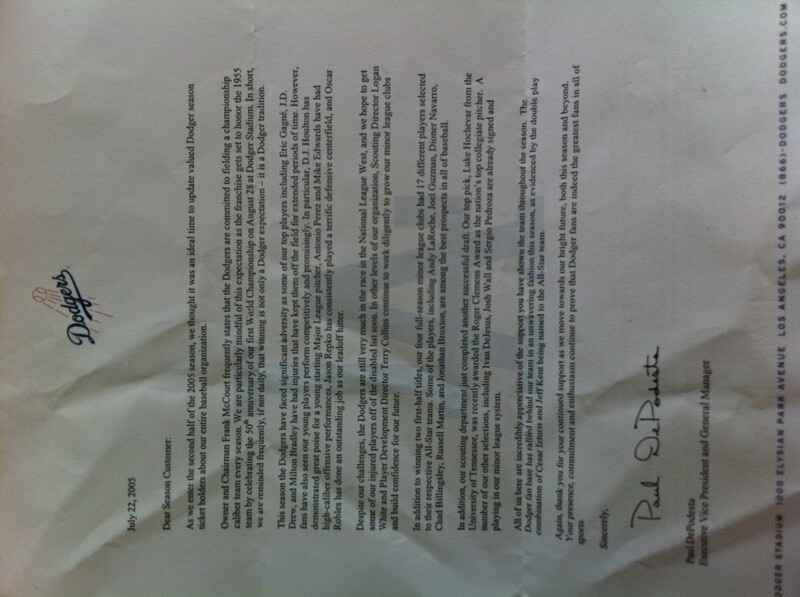 The letter also said that Puig had attended charity fundraisers for an orphanage in Zambia. Defense Attorney Mike Little pointed out to Judge Bales that prior to this event, his client had a clean record. And although Puig did not have insurance papers with him when he was pulled over, he did have insurance at the time and brought those records to court. Attorney Little recommended community service. In the ever-more-complicated process for reaching baseball’s Hall of Fame, the latest batch of previously rejected candidates includes Steve Garvey, Tommy John and Joe Torre. Tommy Lasorda is among the 16tet that will have a say in the process. Of the names on the list, Marvin Miller strikes me as most deserving. Craig Calcaterra has more at Hardball Talk. I wrote the following nearly three months ago, then decided to hold on to it for a little bit. Rather than put it in the attic, I thought I might share it with you. It is the middle of August in 2013 as I begin writing, and there is a baseball team. For nearly two months, it has been winning every game, and that’s almost not a figure of speech. It’s somewhere in between a literary device and true reality. Eight losses in nine weeks in Major League Baseball is, essentially, winning every game. It is a team that at once has been giving the lie to the idea that you can’t have it all, while also reminding that such feats of transcendence are precariously temporary. With every victory comes the question, “How can this possibly continue?” The question has an answer, which is that it can just keep on keepin’ on, same as it ever was, same as it ever is. But just as easily as it can continue – more easily, no doubt – it can stop. How long, then? How long does all remain all? That’s one mystery. In the case of this particular baseball team, if all remains all, or nearly so, for 2½ more months, and if it does, it will create an everlasting memory. What the devoted of this particular baseball team are waiting to learn is if they are having a summer fling – the wildest one of their lives, perhaps, but still a fling – or a relationship that will be theirs forever, even if future years return rocky times. One of the lures of baseball, of investing passion into a passion you have no control over, is that little if anything can diminish a championship. No matter your present, there’s no guilt in romancing your past. Contrast that with everyday life, where if you think about your greatest year, the year you yourself had it all, there’s a gloom. It could be a sliver or a swath. To avoid it, you’d have to be able to feel unadulterated pleasure over a time that is no longer yours, find complete solace that your best days are behind you or only speculatively ahead, that you had something and you lost it or you had it taken away from you, and that’s just fine. People who can do that are remarkable. I can identify two periods where I quite nearly had it all, two championship runs. One came from my earliest memories nearly through the end of grade school, growing up with a family that I loved, friends who were close and a belief that I could become whatever I wanted to become that didn’t involve being a pro athlete. Or tall. I was among the shortest in my class, and even as incompetence evolved into competence, there was never a chance. But with Vin Scully as an alternative role model, I could live with sports transcendence as a fantasy. That period ended when I began having crushes on girls. I’m not sure there was ever a period when I didn’t like girls, but it didn’t begin to matter until fifth grade bled into sixth and I began to care whether one, and then another one, liked me back. Soon something happens inside of you and you start to envision real benefits, and it starts to matter more and more. And it was years before one really did like me back, for reasons we might be able to get into later. By the time that did happen, I was an adult with goals. As long as those goals were unfulfilled, well, obviously having it all was out of the question, even if the other thing was falling into place. Not until after I turned 30, after some very up-and-down years in the intervening decade, did I come close to having contentment. A woman had fallen in love with me, and I with her. I was able to support her, with money saved. My relationship with my family was healthy, my family was healthy, I was healthy. And my career was in a good place. It had momentum. That lasted … about a season. It was a championship year, a year that I’ve been chasing ever since. 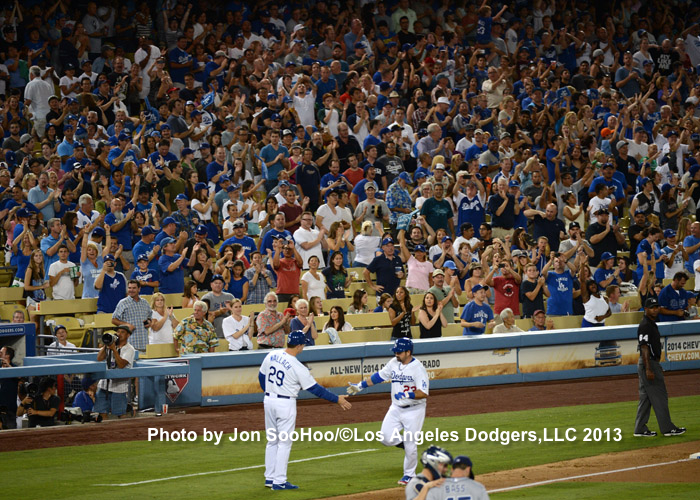 In August 2013, the Los Angeles Dodgers had been chasing their last championship for 25 years. The digits 1988 have a celestial feeling, any negativity washed away. It is impossible for a fan of that baseball team to feel anything but positive about that year, anything but pride, anything but love. That so many years have passed since that time is frustrating. But being a baseball fan is like being a like a little kid because it’s not your responsibility to make the joy happen. You’re waiting like a child, young as they come, depending on a parent for well-being. Rooting for the World Series isn’t without a cost, but as much as you care, you’re a spectator. When you root for your own happiness, it’s your game.